Saeed Research Studio will be launching its first venture ‘The Happieee Place’ in Lahore on 5th Nov, 2017. THP is a platform for young curious minds where they are encouraged to think, make , create, exhibit and publish. Within it’s walls will have Pakistan’s first Communal Bindery. It will host National and International Artists and Scientists residencies as it continues to grow in couple of months. Saeed’s recent project features in CLOSE UP – Blog of Shutter Hub UK – June 2017. She discusses The Psychogeography Of The Right Thumb series & her process in detail. Saeed’s work to be shown in PHOTOMASTERS 2016 as part of the PHOTOBLOCK project by The Old Truman Brewery. Saeed will be showing parts of ‘The Psychogeography of the Right Thumb’ series with recent MA Photography Graduates from across the UK at PHOTOBLOCK 2016. Kate Bush, the photography Curator of Media Space at the Science Museum – London writes about Saeed’s recent series. Saeed’s latest series, The Psychogeography of the Right Thumb’s review that Kate Bush wrote published in Source Photographic Review Magazine as a part of their Graduate Photography Online 2016 among the selections of Shoair Mavlian, Curator at Tate Modern & by Cliff Lauson Curator, Hayward Gallery at Southbank Centre. 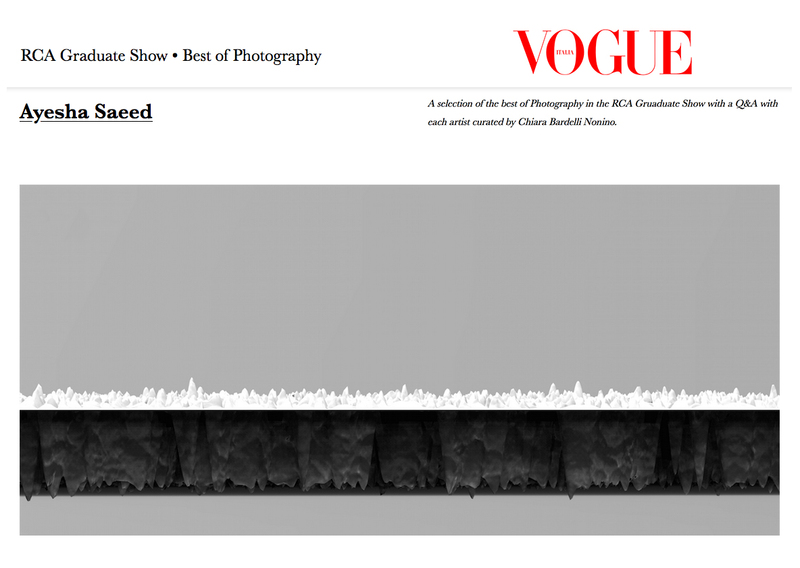 Saeed’s recent work featured in Vogue Italia, curated by Chiara Bardelli Nonino. Saeed’s new series, The Psychogeography of the Right Thumb shortlisted as a selection of the best of Photography in the RCA Graduate Show. Saeed’s MA Photography Show Opens at Royal College of Arts, London on 24th July, 2016. Will be looking forward to seeing you guys there. Saeed’s performing with Juan Cruz and friends at Lychee One Gallery, London – 19th May, 2016. Saeed’s Artist’s book displays at Offprint 2016 – Tate Modern, London – 20th May, 2016. Saeed & friends will be showing an interactive installation with dry ice at Royal College of Art, Kensington Campus on 30th October, 2016. The work is the byproduct of Data Provocation Workshop at RCA by Karin von Ompteda. Intense data session in process. Finally figured out the details. Saeed’s Artist’s book on display at Offprint 2015 – Tate Modern, London – 22nd May, 2015.